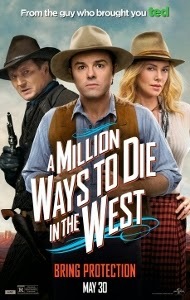 Writer-director-producer Seth MacFarlane steps in front of the camera for A Million Ways to Die in the West, his first live-action starring role. The Family Guy creator and Ted director acquits himself handily, displaying a breezy persona reminiscent of Albert Brooks at his lightest. It’s a raunchy Western with extremely low ambitions, but the laughs are consistent. With such a thin, predictable plot, the nearly two-hour running time could’ve easily been shaved by a half hour (a third-act peyote trip tangent should’ve been the first thing to go). Even the bawdiest jokes are delivered in an amiable fashion that will likely only offend the most sensitive viewers. At its heart, A Million Ways is a surprisingly sweet romance between bumbling shepherd Albert Stark (MacFarlane) and a beautiful stranger who rides into town, Anna (Charlize Theron). The year is 1882. The setting is Old Stump, Arizona. Albert has been unceremoniously dumped by longtime girlfriend Louise (Amanda Seyfried) in favor of moustachery owner Foy (Neil Patrick Harris). He’s heartbroken until the arrival of a mysterious visitor, Anna. She’s the only one in Old Stump who shares his peculiarly 21st century-oriented perspective of the Old West. As stated in the title, everything around these settlers is potentially fatal – from predators, to gunfights, to disease. As educated individuals, Albert and Anna immediately bond over their shared disgust for the Western lifestyle. What Albert doesn’t know is that Anna is married to notorious outlaw Clinch Leatherwood (Liam Neeson). While Clinch is away on business, Anna and her ne’er do well brother are laying low in Old Stump. Emboldened by Anna’s confidence-boosting presence, Albert challenges Foy to a dual. He has one week to train, with ace shot Anna helping him. Though arguably underused, Harris has fun with Foy’s outmoded profession, belittling Albert for not being able to afford the various crèmes and tonic necessary for a well-groomed moustache. For better or worse, that simple plot doesn’t offer any twists or particularly surprising turns. As Albert falls deeper and deeper in love with Anna, the truth about her marital status will obviously hit even harder. But the steady stream of gags keeps the proceedings giggle-worthy throughout, occasionally even gut-bustingly uproarious. Many of the funniest moments involve Albert’s friends, prostitute Ruth (Sarah Silverman) and her virginal boyfriend Edward (Giovanni Ribisi) – they’re “saving themselves” for their wedding night, even though Ruth beds 10 men a day (and that’s a slow day, we’re informed). Neeson plays his villainous role straight, with his appearance serving more or less as a framing device. Plenty of cameos (some obvious, some blink-and-you’ll-miss-it) pop up throughout, with a particularly inspired one unfortunately spoiled for anyone who has seen the trailers and TV spots. While not likely to ever be regarded as a comedy classic, it works reliably as counterprogramming in a summer overstuffed with the typical special effects-driven action extravaganzas. A Million Ways to Die in the West stands quite tall within the relatively limited niche genre of Western spoofs.